Successful business agreements are the key to managing business relationships. Businesses cannot run effectively without well-executed and comprehensive negotiations and agreements. Written agreements provide documentation that will help determine rights and responsibilities should a legal dispute arise, and it is unwise to conduct business without written business agreements—from vender contracts to employment contracts. Documentation is also helpful to specifically lay out how a dispute will be resolved. Our firm has a wealth of experience negotiating routine and complex business agreements to meet the goals and ambitions of our diverse client base. Effective negotiations are vital to be sure that your business gets what it wants out of any agreement. Negotiation is a skill that is difficult to master and those who are extremely skilled at the craft have years of experience. 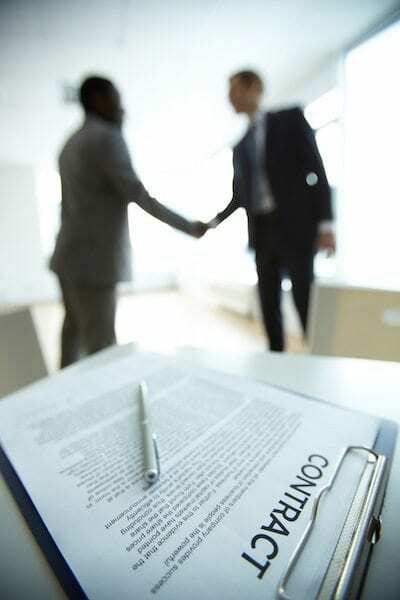 When it comes to negotiations over business contracts, legal knowledge is important as well. The power of persuasion, persistence, and legal knowledge are all crucial to developing a contract that will work for all of the parties involved. Our attorneys have all of these attributes, and they can help you make a deal that is perfect for your individual situation. Once negotiations have concluded, the next step is drafting a well-thought-out contract. Contracts that are thorough and consider potential problems before they occur will be an invaluable tool for your business. Drafting skills take both a creative mind and an eye for detail, both of which our contract attorneys have. Even after a contract is drafted, the parties may need to go back to the negotiation table if some point of conflict arose during the drafting phase. Our attorneys are happy to negotiate on your behalf at any stage in the process. We are not satisfied until you are. From small closely held companies to nationally recognized Fortune 500 Corporations, our clients receive the service and response necessary to complete transactions in today’s fast-paced world of business. Our attorneys incorporate their expertise in a wide range of practice specialties to bring solutions and deal points often overlooked. With a full command of the Uniform Commercial Code and a commitment to stay ahead of emerging trends under existing law, the attorneys at Carnahan, Evans, Cantwell & Brown bring value to each negotiation and business agreement which ultimately impacts “the bottom line.” For more information about how we can help your business develop and negotiate its contracts, call 417-447-4400.